The growing number of medical applications of lasers and other optical technology has brought together scientists from diverse backgrounds. Communication in the field has suffered from inconsistency in terminology, units, and symbols. 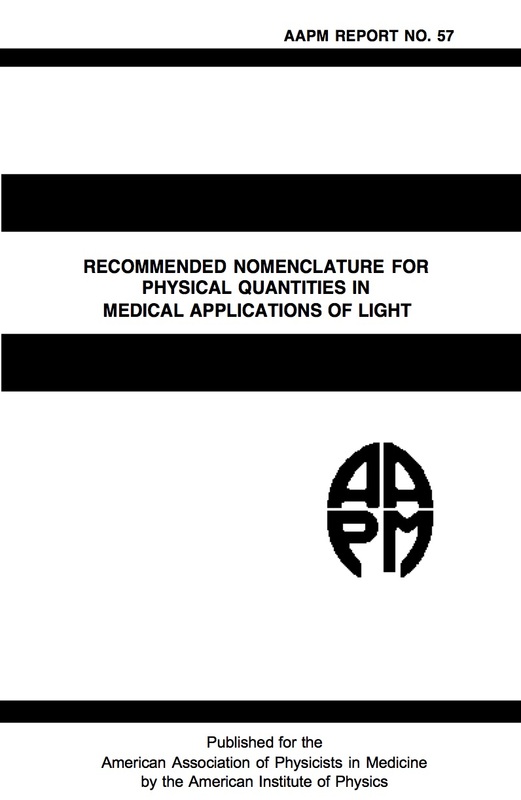 The purpose of this report is to recommend standard nomenclature for quantities frequently used, especially in dosimetry and modeling of radiation transport. We have examined a number of reports from other bodies including: 1) International Commission on Radiation Units and Measurements Report 33-Radiation Quantities and Units, 2) International Union of Pure and Applied Chemistry-Glossary of Terms Used in Photochemistry, 3) Quantities and Units of Light and Related Electromagnetic Radiation. Int. Standard IS0 31/6, International Organization for Standardization 1980, 4) Radiometric and Photometric Characteristics of Materials and their Measurement. International Commission on Illumination (CIE) 1977 No. 38, and 5) American National Standard Nomenclature and Definitions for Illuminating Engineering ANSI 27.1-1967. As well, earlier drafts of this document have been circulated among our European and North American colleagues. Fortunately, it is possible to derive a consensus on definitions for the physical quantities of interest. Not surprisingly, however, there is still considerable disparity among the symbols which arise from the radiation physics, chemistry, radiation transport, and engineering literature. Therefore, while we recommend the universal symbols summarized in Table I, we recognize that conventions in the different disciplines will probably cause some remaining diversity in usage. The report is organized in three sections: quantities describing the radiation field. quantities describing interaction of the radiation field with tissue, and quantities recommended for dosimetry records.